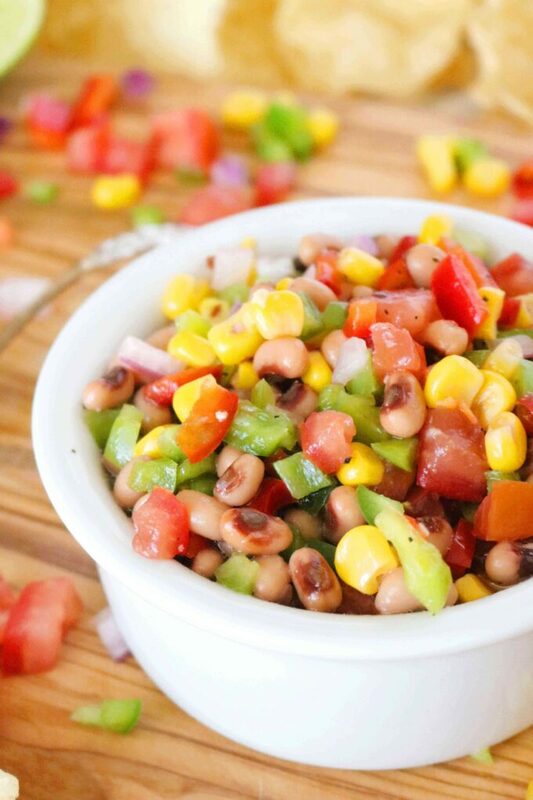 Texas Caviar consists of three main elements: Canned black-eyed peas, finely chopped vegetables, and a tangy dressing. Canned black-eyed peas are about as simple and straight-forward of an ingredient as you can get, however, do not skip draining and rinsing the peas. If you do not rinse them, they will add a gritty and unappetizing texture to your dip. Texas Caviar is a light and healthy dip that is brimming with gorgeous color thanks to all those bright and vibrant summertime vegetables. If you grow a summer garden, this dip is the perfect way to use them up! Feel free to eliminate the vegetables you don’t dig on or add any crisp veggies you just can’t get enough of to the lineup! If you’d like to add diced avocado to your ingredient list, you can certainly do so as it pairs wonderfully with all the flavors and textures in the dip! However, avocado has a tendency to brown quickly so be sure to wait and add it until just before serving. This dip is tangy and bright, with an almost pickled quality to it thanks to a generous pour of homemade vinaigrette. For your homemade vinaigrette, you can use just about any vinegar you have on hand (aside from balsamic), but if you happen to have either red wine or apple cider vinegar — bonus. Their flavor profile is best suited for this dip. If you don’t want to take the time to make a homemade dressing, you can substitute store-bought Italian dressing or red wine vinaigrette. You’ll need about 2/3 cup of store-bought dressing. The only real prep work involved when it comes to this easy Texas Caviar recipe comes in the form of a little chopping. Beyond that, we are simply combining a little vinegar with sugar, lime juice, a few spices and some oil…and that part is optional. Whisk vinegar, seasoning, and oil together for vinaigrette (if making). Rinse black-eyed peas and chop vegetables. Combine vegetables, black-eyed peas, and dressing in the bowl, stir to combine, and marinate in the refrigerator until chilled (or overnight). If you chose to make the vinaigrette from scratch, combine vinegar, fresh lime juice, sugar, salt, and red pepper flakes in a medium-sized mixing bowl. Then, very slowly add the oil, whisking all the while. If you’re not making the dressing, see “Dressing Options” above for simple store-bought substitutions. As mentioned above, rinsing the black-eyed peas is an essential step for this dip, so drain and rinse your peas and move along to chopping your veggies. Seed the Roma tomatoes (see a simple hack for that here) and dice them, along with the peppers and the red onion. Once you have your vegetables prepped, add them to the bowl with the dressing and toss to combine. Cover the Texas Caviar and transfer it to the refrigerator to chill. This dip is best served cold after it has had time for the peas and veggies to pick up on all that flavor from the dressing. 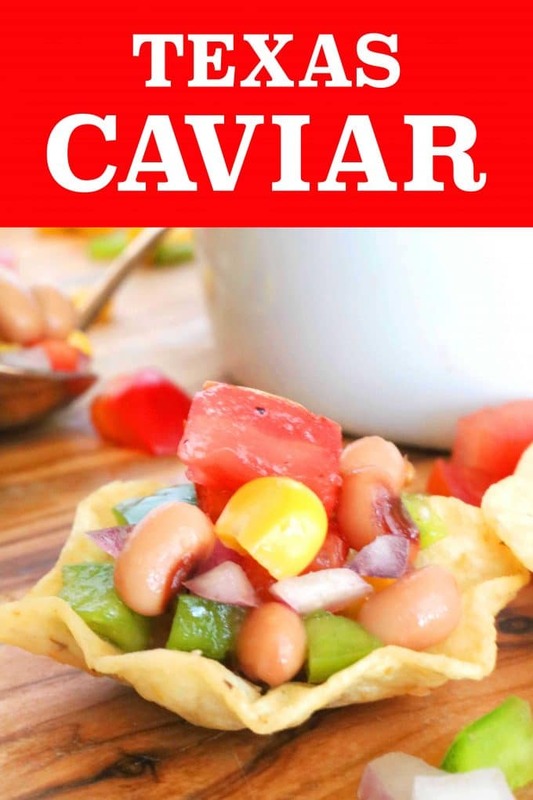 You can allow your Texas Caviar to marinate for as long as two days in the refrigerator before serving, but you should give it at least 3 hours if at all possible. Try serving it with a Summer Cocktail! 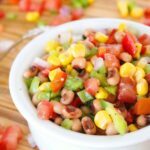 Black-Eyed Pea Salad shows you another way black-eyed peas are bursting out of their comfort food tradition in a gorgeous, healthy salad loaded with light and refreshing ingredients! Serve it as a side dish or a dip with pita chips! Mexican Layer Dip is an easy appetizer perfect for feeding any crowd, and will win over any room! It comes together quickly and features layer-upon-layer of savory goodness like bean dip, guacamole, and more. Dill Dip is a classic party dip that’s fresh, tangy and full of flavor thanks to the simple additions of spices and herbs. The best part? It comes together in just 5 minutes! Whether you serve it on a vegetable platter or alongside potato chips, you can rest assured — the crowd will be sending droves of compliments your way. Mexican Shrimp Cocktail builds bigger, better flavor faster by using quick-cooking pan-seared shrimp, dressed in a vibrant cocktail sauce, with creamy avocado, and the perfect blend of crunchy vegetables. Serve it with tortilla chips…or a fork! Homemade Salsa is easier than you think. All you need is some fresh vegetables and a blender! This one tastes eerily similar to the beloved Tex-Mex restaurant Chuy’s famous salsa fresca! 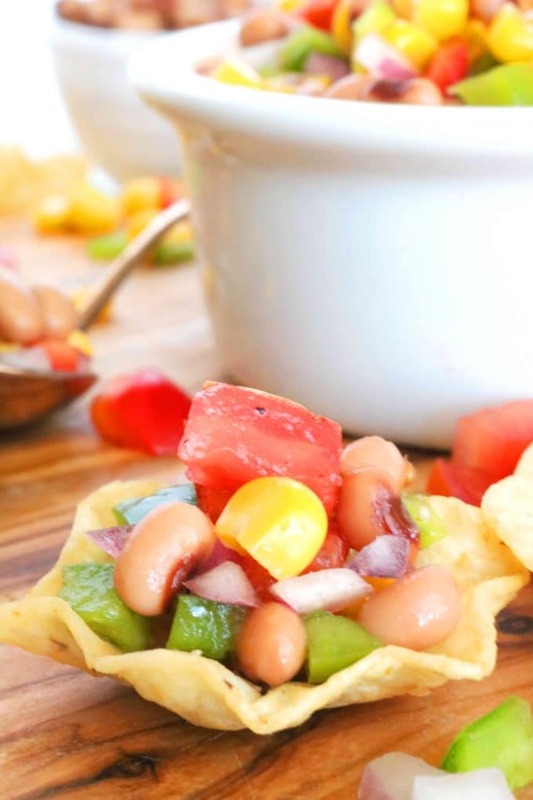 A recipe for colorful and zesty Texas Caviar, a make-ahead party dip loaded with fresh summer vegetables and hearty black-eyed peas. 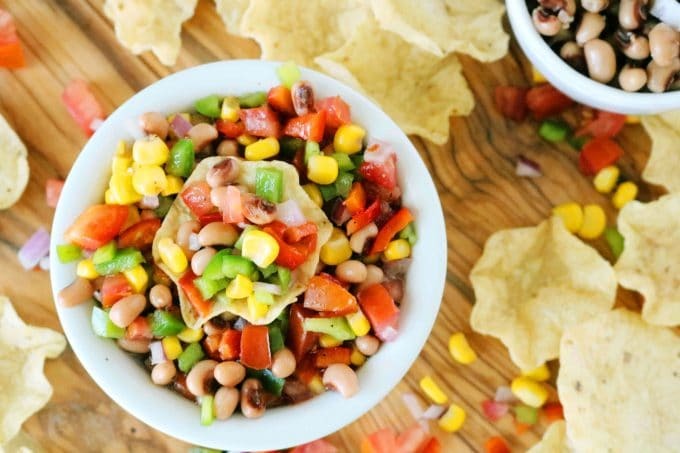 This light and healthy appetizer is perfect for any spring or summer gathering, and can be served with tortilla chips or as a topper for any grilled protein! In a large bowl, whisk together red wine vinegar, lime juice, sugar, 2 teaspoons, salt, and red pepper flakes. Very slowly, drizzle in Canola oil, vigorously whisking all the while. Add the black-eyed peas, corn, tomatoes, bell peppers, onion, and jalapeno to the bowl along with the remaining 1/2 teaspoon of Kosher salt. Stir ingredients together, making sure everything was coated in the dressing. Cover with plastic wrap and refrigerate until cold, at least 3 hours before serving. If you are not making the dressing, you can sub in 2/3 cup of store-bought dressing such as Italian dressing or a red wine vinaigrette.